RUIL team members Rachel Nordlinger and Nick Thieberger recently gave three workshops at the WANALA Aboriginal Languages conference. The training sessions were on Elan and recording techniques, as well as talking about the Daisy Bates project and the nature of adjectives and adverbs in Australian languages. 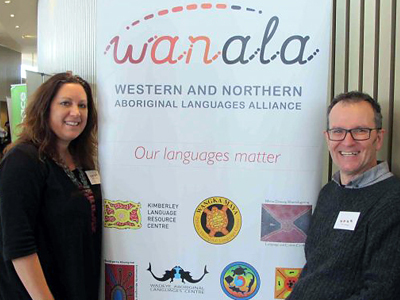 WANALA is the Western and Northern Aboriginal Languages Alliance,a collaborative alliance for all Aboriginal organisations, projects and activities in the region aimed at supporting, promoting, and teaching languages, and providing services such as interpreting and translation. This year's conference was held in Kalgoorlie (Western Australia), and directed at those who work with Indigenous languages around Australia - speakers of Aboriginal languages, workers at language centres, those involved in language projects and schools running Aboriginal language courses. The conference was attended by over 100 people from not only Western Australia, but also from other parts of Australia. As outlined on the conference website, "the theme of this conference relates to the critical role language plays in building personal and community resilience. Language is an expression of identity and a carrier of identity. Language is a means to express intellect and a way to develop intellect. By ensuring languages are kept strong, healthy and vibrant, Aboriginal people build resilience. Conversely, resilient communities keep language strong, healthy and vibrant. The organisers invite papers and presentations that demonstrate the ways in which language is used to build identity, intellect, strength and resilience." As well as delivering the training, Rachel and Nick heard reports about a range of activities and attended the launch of the newly established Goldfields Aboriginal Language Centre. There was also a pop-up Aboriginal language museum, a short films festival and an Aboriginal arts and crafts market.